Hi I wanted to order a candle or 2 services, though I'm stuck in which one would work good for my situation. I believe the best would be Cast off Evil white candle, though before purchesing I was hoping I could get help with which one is best. I have a friend, who we have a complicated friendship due to the fact that we both are infatuated and want to be with one another. Though he has a girl who he says he's fallen in love with ever since he met her months before meeting me. The thing is (and many have warned him) that she has made it clear to him that she is not interested. Nor will she ever be with him becuase she does not care about him more then a "friend" (if you even call it that becuase a lot of us don't even believe she is a friend to him). Though she uses the fact that he "likes" her to use him. (I.e money, rides, taking her places, buying her things,etc) We talk all the time, about everything. He tells me how it doesn't matter all the pain or hurt she puts him in that he will endure it and be patient hoping one day she'll change her mind and see everything he does for her. Though at the same time, knows how he feels about me and doesnt wanna lose me. Yet that its complicated for him, because he feels he loves her, although wanting to be with me and be in a relationship. The thing is, His mom since day 1 never had a good feeling about her. Her and I have spoken about things, because she said this past Christmas was the last straw for her. She has seen the girl use him for all the money he makes. (He's always broke, because he uses it on her, she even got him to move w her so he could pay for the rent.) Though on occasions that his mom made comments about her being his "girl". She was always quick to snap back saying she will never be with him,etc in front of his mom and family. This past christmas she had enough after the girl made a remark about how he shouldnt eat dessert because he was already too fat (given that he really is not). His mother went off on her and had enough. He of course defended the girl saying she was right. His mother on one occasion said "Being half serious, it's almost like she put a curse on him". (though i know his family isn't really into the supernatural and such as I am. So of course i didnt want to make a big comotion that those things can really happen. It is now to the point that yes, I care about him more then a friend and want to be with him. But I care about him as a person more and his well being. His mother and family believe things also are not well for him and are scared. His depression for "loving" this girl who doesn't even care about him. Can end up something worse. That is just an over view of the situation. 1) So which candle would be best in helping him realise she is not good for him, that she is just using him while she goes out with multiple men every night. So he can come to senses that his "love" for her isn't truely ideal, that if she cared for him she would treat him with respect and dignity and not use him. So he can escape her "manipulation" and have her stray away from his life. He's letting her ruin his friendships, family, work, school and everything else for nothing. I do have feelings for him and wish things could be different so that we could be together. But I don't want anything to happen to him, nor let him continue ruin his life for her. 2) As well as , once I do purchese a service, is there a certain way I need to write out the petition? 3) Which email do i send pics,information too? This is different than candles like Uncrossing, Jinx Killer, and Reversing that deal with countering attacks conducted via conjure, hoodoo, rootwork, or spell-casting. 1) Cast Off Evil would be good. 2) So the question really resignates with you, what outcome do you want? Do you want to draw him closer to you? ...since you say the girl is not an issue. She is not interested only he is interested. Your petition should simply be a short statement of your desires. Sorry forgot to write that, that may have helped. Well eventually of course I would like things to work with us, if thats were it led to. As, he and I do have interest in one another. Though he is caught up on her, and I have made it clear to him that I do not want anything with him still in that situation. As when she first found out he was interested in me and was going to ask me out, she was quick to start telling him she liked him. Knowing that it would catch him. She's as a call a floosie, and has told many people it doesnt matter who she needs to sleep with if they wanna give her things. Luckily for some reason she hasnt slepted with him, though uses him for everything. And uses the fact that she knows he's interested in her to keep him tied. My main focus because not only am I worried for him but even his family. Is for him to get away from her, get a clear head to see that she does not care about him and see her for who she really is. I believe them living under the same roof, or her having any access to mess with his mind and heart is what is messing him up. I'm dealing w/this messed up situation. It's all over the boards, but after having an in depth conversation w/ my child's father yesterday. I now know why my Break Up work, Hotfooting, & etc.. doesn't seem to stick for him & his meth head girlfriend. This time I'm getting MISC to back me up. At first I ordered a Hotfoot candle, but my intuition told me to pair it with a Cast Off Evil vigil for him. Tonight one of those people who've been trying to hurt me, has approached him and befriended him. They stood there chatting for a while. I worry he's trying to gain his trust, or trying to keep us apart. Is Cast Off Evil the MISC candle I should go for? Also, I know very little about the man who's been badmouthing me.. Just his name, I think. Is that enough? 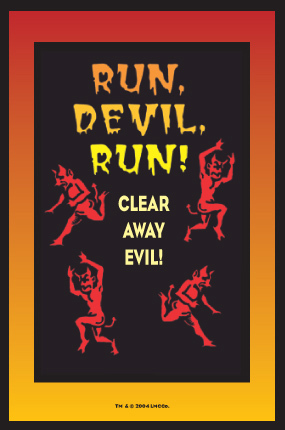 Cast Off Evil and Run Devil Run are commonly used to send away a friend or lover's bad companuions. If you wish, you could add a Hot Foot Caqdle too. Hot Foot doesn't require cleansing after, right? Don't want any jinxing.. 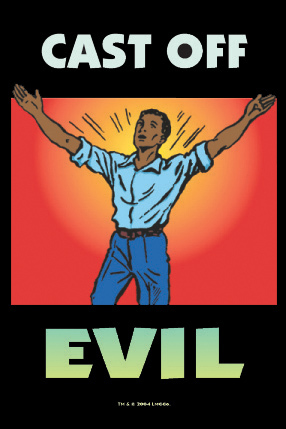 Cast Off Evil and RUn Devil Run are not curses and require no special cleansing aftewrward. Hot Foot is a curse, and you would want to do a cleansing afterwards. Just making someone go away is not a curse, but Hot Foot is intended to make them be driven out of town and wander the world. After talking to MISC I decided against a Hotfoot candle and went with a Cast Off Evil one (a few days ago). But have been doing work on my own too. This is all intuition though. But my intuition doesn't normally fail me. I thought, next time I speak to the intended (since we both pride ourselves on being able to have a 100% open conversation and trust each other... I mean, we've told each other some really personal stuff... before he started getting friendly with the badmouther) - to actually say that I felt bad vibes between the two of them tonight. He already knows that I'm not friends with that guy since he's been badmouthing me (I told him everything when they just started talking. Unfortunately it didn't stop them from chatting more and more). And I trust him to be frank with me - to be honest. So I hope he'll just tell me if he said anything about me... since tonight I truly feel he had. Cast Off Evil is a candle that many of my clients find useful for weight loss, by the way. When used in this way, a Healing Vigil and a Blessing may also be set. See the thread on Healing candles for more information.